But last Friday, en route to a speaking engagement at the Engaging Orthodoxy panel in Chicago, I decided to take a slightly different approach. Instead of avoiding it, I decided to spend some time with what is likely the foundation of my travel anxiety: the fear of death. As a kind of social experiment, I sort of flashed this book cover around at my fellow plane passengers more than I would have otherwise. I wanted to know who else spends an inordinate amount of time in flight stressing out about the similarities between airplane and cemetery layouts. Unrelatedly, did not happen to make any fun travel friends this flight. 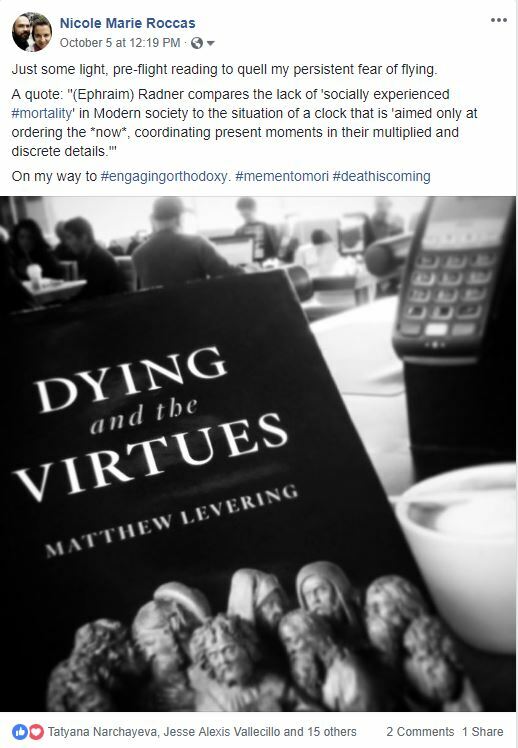 I had skimmed Matthew Levering’s recently published Dying and the Virtues as part of my research for the Death in Orthodox Tradition course I’m co-teaching this semester, but hadn’t yet had time to give it the attention it deserved. If you aren’t aware of Levering, he is a (Catholic) Professor of Theology at Mundelein Seminary and is active in ecumenical dialogue, particularly between Catholics and Evangelicals. He is also one of the most prolific academic writers I know. A long day’s travel to an event where Dr. Levering would be one of the respondents felt like an appropriate opportunity to finally read his book more closely. Before I even get to the airport, my trip to any speaking engagement begins with a 1.5 hour commute via subway and bus shuttle from one side of the Greater Toronto Area (where we live), to the other (where the airport lives). I opened Dying and the Virtues as the subway passed west through Victoria Park Station, about three stations into my thirty-station trek. The book opens with a question: “Is dying … a ‘disaster’ for Christians, or is it simply a passageway to the Lord?” (p. 2). In other words: what is death–in general, but particularly for the Christian? Is it bad or good, annihilation or transfiguration, destruction or resurrection? To come down too simplistically on one side or the other is to overlook the true gravity of death, usually to our detriment. Levering, through the voices of numerous thinkers he cites, pushes for a multifaceted picture of death: “Dying is both a devastating threat to be feared and, in Christ, a passage to the fullness of life whose mode is self-surrendering love” (p. 4, emphasis mine). Because death is unnatural, it is rightly to be feared and (to a certain extent) resisted. But because Christ has conquered death, and redeemed it as a passage to greater communion with Himself beyond the grave, it is also important that it be faced rightly. Here we arrive at the leading inquiry of Levering’s project: “What would it look like for a dying person to have a ‘life … hid with Christ in God’ and to ‘blossom’ on Christ’s grave? My answer involves what I call the ‘virtues of dying'” (p. 4). While this enumeration risks a cliche appearance–it’s hard to reinvent the virtues, after all–Levering’s exploration of them is unique, multifaceted, and characteristic of his erudite mastery of synthesis (in layman’s terms: this man has read A TON of books!). As Levering rightly points out, death is not optional, but participation in the virtues is. They “enable us to embrace our dependence upon divine love” (p. 12). My favorite chapter was that on gratitude, in which Levering walks through St. Gregory of Nyssa’s account of his sister, St. Macrina’s, dying days. Despite being overwhelmed by sudden fever, St. Macrina was blessed with lucidity until the very end, holding forth on all manner of theological and eschatological subjects until nearly the last day of her life. In the midst of discussions and periodic rests, St. Macrina also reflected on her life, recounting its events in narrative form and offering up the memories of her earthly life in profound thanksgiving to God. This was a beautiful reminder; ordinarily, we picture saints being unconcerned with the earthy particularity of their lives. By contrast, Macrina gratefully remembered her parents, her loved ones, and experiences that helped shape her faith in the Living Lord. “Gratitude,” Levering notes, “is the measure and purpose of her looking back on her life” (p. 90). Yet the importance of gratitude, in this example, contrasts somewhat with a point he made earlier in the book: “In my view, penitence [repentance] must be the first attitude with which we look back upon our lives, since God knows all the wounds we have caused” (p. 8). So which virtue is it–gratitude or repentance–that is to form the basis of our retrospection? This, in my mind, is an undeniably crucial question; so often the biggest obstacle to “remembering death” in the ascetical sense is having to face the searing pain of “wasted” and “regretted” time in our lives. It seems to me that before we Christians can learn to face death, or even acquire the virtues associated with facing death, we must learn first develop a way of looking back on our past that will not cause debilitating despair. Perhaps we should avoid demanding an “either/or” answer to this question–perhaps our retrospection should be sourced in both repentance and gratitude. Of the two, Levering seems to view gratitude as the more foundational element of memory, i.e. “our principal motivation and existential stance.” With thanksgiving toward God as our basis, the life of repentance is given proper context in our hearts and in our perceptions. Instead of looking back on our sins with despair, fear, and bone-chilling regret, repentance (when tempered with gratitude) allows us to turn from the gravity of sin and toward the newness of life granted to us in Christ. As Levering sums it up, “these two virtues are ultimately inseparable for the Christian” (p. 8). Although I continued reading the book through the duration of my travels, ultimately finishing it the day after I returned from my trip, a funny thing happened that first day in Toronto as I read its first few introductory sections. 45 minutes into my trip to the airport, I momentarily looked up from the book and stared out the window to face west-side Toronto. Outside, low-rise storefronts and narrow apartment buildings whizzed past. All at once, the scenery keenly reminded me of the outlying areas of Chicago, where I was heading (and where I have often spent time in the past). For several long moments, I could not remember where I was: in Toronto or Chicago? Had I already been on a plane? Was I journeying to the airport or away from it? Where am I? It was the mental equivalent of staring at an optical allusion, it took a few moments for my brain to get both locations straight and remember where I was. And as briefly as it lasted, those moments contained within them all the magic of being in two places at once. As though on cue, a Tim Horton’s zoomed past the window and swiftly knocked me back into Canadian spatial reality. This is not the first time the combination of reading and traveling have knocked my sense of place and time out of joint. But given the reading material, I began to wonder: is this a little what death will be like someday? Looking up, suddenly, from the pages of one’s life, only to discover with gradual clarity where one really is. Where one really has been all along: in Christ. I don’t know. But I do know that when that day arrives, for me, it will (I pray) be more meaningful thanks to the God-given and God-sustained virtues Matthew Levering has so deftly explored. I didn’t talk about it much in this post, but the Engaging Orthodoxy 2018 panel discussion (“What does it mean to be human?”), where I was fortunate to get to meet Matthew Levering in person, is well worth watching. Here I’ve provided timestamps to the different talks. One of the highlights, for me, was Levering’s response to my paper, in which he challenged the idea of whether or not God has “impeccable timing” (as I phrased it in my talk). 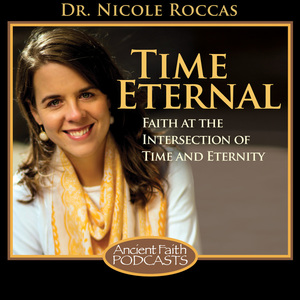 If you’ve ever struggled to make sense of God’s timing, in scripture or in your life, our exchange might be helpful.